The data center Serverius DC1 uses the latest technology, is completely CO2 neutral and runs on 100% green electricity. The entire grounds (including parking) is fenced, the entire area is equipped with CCTV (inside and outside), a "SmartCard" and a pincode is required to open specific doors. Because the cold corridor system is highly-efficient with its energy use; each row of racks contains a cold corridor, where the air conditioning comes in. The cold air enters the ventilation of the servers, after the cooling it goes to the hot aisle. Each rack is completely closed with blanking plates so that no cold air is lost. All the used energy is green. 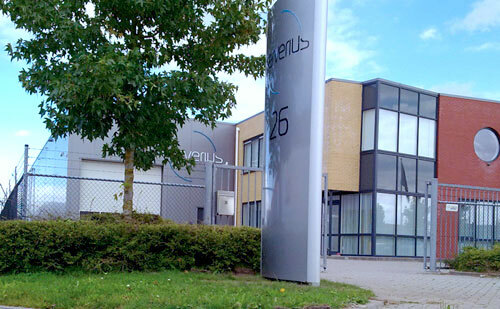 Because of the ideal location in Dronten this data center is easily accessible by car and train. It is possible to make use of this data center at very competitive prices using a premium network that is monitored 24/7/365 by a team of 14 network professionals. 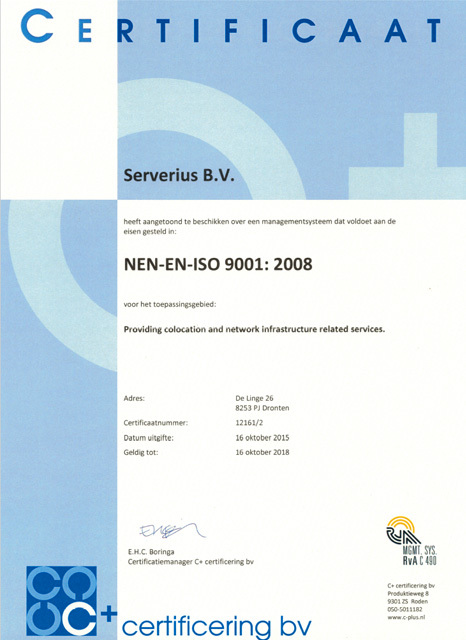 Serverius DC1 is ISO 9001 and ISO 27001 certified. ISO9001: This International Standard specifies requirements for a quality management system where an organization needs to demonstrate its ability to consistently provide products that meet customer requirements and applicable laws and regulations; and whose mission is to increase customer satisfaction through the effective application of the system, including processes for continual improvement of the system and the assurance of conformity to customer requirements and applicable laws and regulations. If any interruptions occur, we are available on site in 30 minutes; even during rush hour! Internal connection with Datacenter Serverius DC2 possible! Need more information about this datacenter location?